The second day of the Origins 2011 conference was dedicated to the technical geology presentations. We got an update on the Coconino sandstone project from John Whitmore, and we had a lively session on the Flood/post-Flood boundary. Since we had a few talks cancelled, we decided to use the extra time to tour the Museum of Geology at the South Dakota School of Mines and Technology. 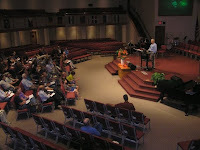 We closed the day with John Morris's reflections on The Genesis Flood. That was a great opportunity to recall the importance of the book, and we learned that Walter Lammerts was tough to sit next to in the car. Who knew? At our business meeting, we voted in a new member of the Executive Council of the Creation Biology Society: Tom Hennigan. Welcome, Tom! We also announced next year's conference venue, Patrick Henry College in Purcellville, VA.
We've got one more day of the conference, beginning with my plenary on "Frontiers in Creation Biology." The first day of Origins 2011 was a great success! The technical talks sparked a lot of interesting discussion and debate, and Art Chadwick's plenary on his dinosaur dig at the Hanson Research Station was well received. The crowd was also one of our biggest. Of special interest to me was Lantzer and Daniels's survey of Christian high school biology textbooks. They argued (shockingly) that when discussing origins (i.e. creation/evolution), Christian texts spend too much time on apologetics rather than science. Remedy? Talk more about science. What a brilliant idea. I'm looking forward to seeing their full paper. I went on my first geology field trip today, which was fascinating. Perhaps more culturally fascinating to me than scientifically fascinating, but I still enjoyed myself. (I admit that a lot of the geological detail was over my head.) Here we are at an outcropping of the "Great Unconformity:"
Speaking as a biologist, I thought the Unconformity was pretty good. I don't know about "great," but that's probably because I haven't seen it across most of the continental United States, which I guess would make it pretty great. 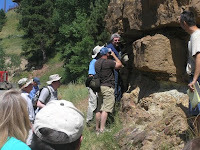 Steve Austin interpreted the Great Unconformity in the Grand Canyon as the onset of the Flood, where the initial Flood waters eroded off the existing rocks from the pre-Flood world. Meanwhile, the conference abstracts are available at the JCTS website, along with a short editorial from Tim Clarey on the launch of JCTS Series C: Earth Science. Despite an unscheduled 24-hour layover in Chicago, I have safely arrived in Rapid City for Origins 2011. It's a little overcast, but otherwise fairly pleasant. 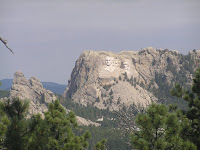 In about two hours, I will head off to the Black Hills to look at rocks with a bunch of geologists, which I think will be more fun than it sounds. Check back later for a brief rundown of the field trip, and then tomorrow we start the conference. Regular readers might recall my interest in carnivorous plants (see posts on toilets, bacteria, and tiny frogs). If the world was originally created with plants to provide food for immortal animals, how did we end up with plants that actually eat animals? That's a great question that I can't yet answer definitively, but I am becoming more and more intrigued by reports of unusual functions of Nepenthes pitcher plants. I previously noted the report of tree shrews using Nepenthes as toilets, with the plants getting nitrogen from the feces. Normally, pitcher plants get their nitrogen from digesting insects. Recently, there a new report of what appears to be a symbiosis between Nepenthes rafflesiana elongata and Hardwicke's woolly bat (Kervoula hardwickii hardwickii). Santos is ridskolans unruly horse. But Sofia loves him! She is saving money and fantasize about the lonely, derelict little barn by the hands cottage. What if she could buy Santos and having him there. One day an ambulance outside the indoor arena. Santos was thrown by a student and ridskolechefen talking about the slaughter ... Sofia's dream is suddenly about life and death. She must save Santos!Apparently the title is Swedish for "Just Me!" or so says Google Translation. And you know how reliable Google Translation is. While browsing in a local antique mall in Dayton recently, I stumbled upon a bookcase full of old textbooks. 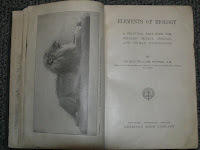 To my delight, I found George William Hunter's 1907 Elements of Biology, the predecessor to his 1914 textbook A Civic Biology that featured prominently in the famous Scopes trial. Best part? It was only $2. I love a good bargain. I've only briefly skimmed the book, but it appears that the concept of evolution occupies a much lower place in this volume than in A Civic Biology. That's not to say that the later textbook covered evolution in great detail. Evolution appears briefly in A Civic Biology when classification and heredity are discussed. The full schedule for Origins 2011 is now available at the CBS website. ORIGINS 2011 Creation Conference in Rapid City! from Marcus Ross on Vimeo. Registration is available right here. There's also still time to register for the CGS/CBS conference held in conjunction with Origins 2011. Register here for just the tech conference, or get a discount by registering for both the tech conference and Origins 2011. ...you got your SNP data backwards regarding the 2001 Nature paper. The SNP rate is much lower (Table 1) - about 4X for the Y-chromosome. The authors use a somewhat confusing "kb per SNP" rate rather than "SNP per kb" rate, don't ask me why.He's right. My apologies. Back in February, I announced that we'd rebranded the BSG as the Creation Biology Society, since that makes more sense than an acronym that doesn't stand for anything. By dropping BSG, we also needed to change the name of our journal Occasional Papers of the BSG. We decided to use this name change as an opportunity to update the software to Open Journal Systems, and while we were making those changes, we invited the Creation Geology Society to join us in publishing this new online journal. We settled on Journal of Creation Theology and Science for the new name, with the CBS publishing JCTS Series B: Life Sciences and the CGS publishing JCTS Series C: Earth Sciences. Where's JCTS Series A? We're earnestly hoping and praying that within the next year or two, we'll be able to launch a new journal devoted to theological and biblical studies, and we've reserved Series A for that purpose. In the new paper, Senter applied distance correlation to even larger datasets, and concluded that indeed morphological discontinuities were found that appeared to distinguish eight dinosaur kinds. 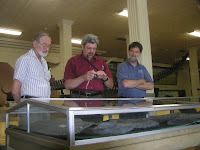 However, he suggests that this raises other problems for creationists, namely: (1) that the diversity within these kinds is enormous and extreme, (2) that some morphological gaps appear to have been filled by subsequent fossil discoveries, (3) that at least one morphological gap identified by Todd Wood was filled when using more extensive datasets from existing museum specimens, and (4) that the basal members of all the major dinosaur lineages appear to be morphologically continuous.